PNG is topical in Australia these days for different reasons, but in the early 1940s it was an unpleasant locus of intense fighting between the Japanese and the allied forces of America and Australia. This was the South-West Pacific Theatre of War, where Generals MacArthur and Blamey vied, with more or less friendly rivalry, for military success against a Japanese enemy which had invaded South Eastern Asia with devastating swiftness in 1941 and whose troops fought with ruthlessness and near- fanatical courage. When we think of the Australian involvement in Papua New Guinea most of us think of Kokoda. The attack and initial defeat of the Australians at Kokoda in 1942 and subsequent campaign along the Kokoda Track looms large in the Australian psyche as a foundation moment borne in suffering, akin to the Gallipoli story of World War 1, although unlike Gallipoli the Kokoda story ends in victory. But our story begins after Kokoda, when in 1943 Private Leslie ‘Bull’ Allen, of the 2/5th Australian Infantry Battalion, already war-weary from Syria and Libya, landed in New Guinea to partake in the military campaign to retake Lae and Salamaua. Leslie Allen was a tall, strong stretcher-bearer, a medic responsible for looking after the wounded. He was already legendary for the lengths he would go to rescue casualties from the line of fire. [i] His nickname ‘Bull’ derived from his notorious football-playing technique. In July 1943 Bull’s company was in the foothills of Mt Tambu, a strategic high point near Salamaua occupied by the Japanese, who by this stage had been pushed back and were becoming increasingly desperate to maintain their hold on the country. Australian troops of the 2/5th, in a courageous bid, had taken the lower ground around Tambu off the Japanese and on 24 July tried to take the mountain and failed with heavy casualties. [ii] [iii] The military hierarchy ordered another try for Tambu, and this time American troops, fresh off the boat, were brought in to attack the mountain. On the 30th July the US 1/162nd Battalion attacked the mountain and fared no better than the Australians had the week before. They got into trouble very quickly in the face of Japanese snipers, machine guns and mortar fire and suffered heavily with fifty wounded. 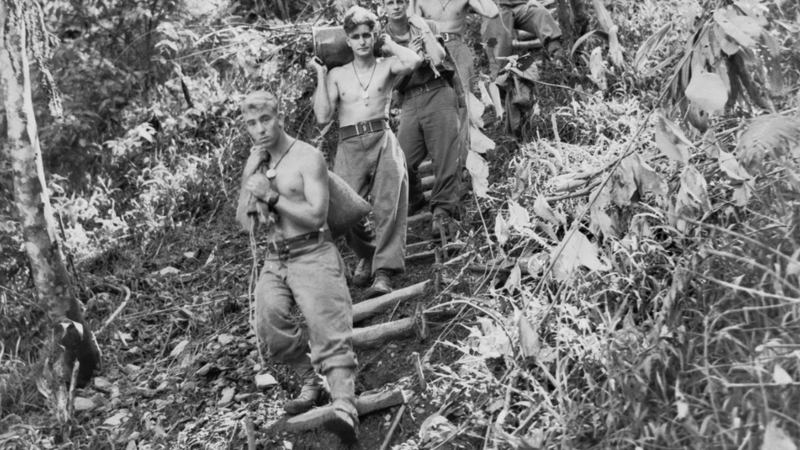 Military historian David Dexter describes the terrain around Salamaua and Lae as “One of the most difficult and unpleasant areas ever to confront troops” requiring “endurance and determination in generous quantities” [iv]. The land around Tambu was murderous, muddy, damp and steep-sloped, and two US medics were killed trying to retrieve the wounded from the active battlefield. The terrain around Tambu was murderous, steep and muddy. Source: Australian War Memorial. Allen’s actions in rescuing the wounded at Tambu were extraordinary. He was under no obligation, apart from his own compassionate impulse, to risk his life in a US action and save men he had known only for a few days. The US recognised this and awarded him a Silver Star, one of their highest gallantry awards. Allen recovered to get married, raise a family, to work and to retire in Ballarat. But he lived with those invisible psychological scars of war trauma the rest of his life. The Ballarat RSL commissioned Wind & Sky Productions to make a film about Allen to raise awareness of a local hero they felt had been forgotten by the community. Financing came from the RSL, from Wind & Sky, who donated considerable in-kind production time, with funds also donated by Bill Allen, Bull’s son, and by Doug Sarah. The RSL’s only directive was that we had to consult the Allen family and respect their wishes in the making of the film. We had several preliminary meetings hosted by the RSL with the Allens and David Cranage and started slowly to build up a knowledge of each other and a trust that we could work together to tell Bull’s story. The challenge for Jary and I was to tell the story of Bull within a short documentary format, and we quickly realised that we couldn’t tell everything. Our aim became to tell enough about Bull to encourage viewers to learn more about him from other resources. 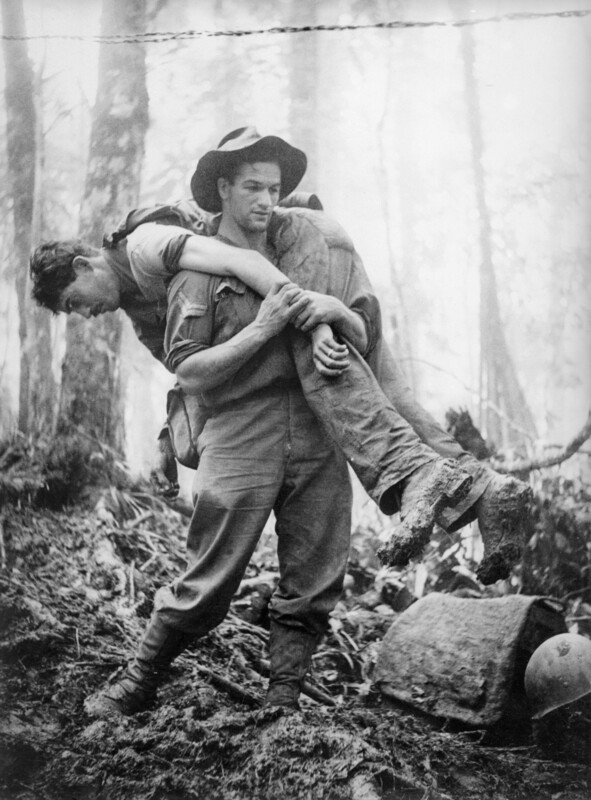 Allen rescuing a soldier off Mt Tambu, 30 July 1943. Photographer: Gordon Short. Image source: Australian War Memorial. We drew inspiration from the famous photograph taken of Bull on Mt Tambu, carrying a wounded American soldier over his shoulder. This photograph, taken by war correspondent Gordon Short, is far better known than Allen himself, and we decided our approach would be to tell the story behind the photograph, to relay the events of the 30th July 1943, but also to give the sense of Bull having led a complete life before and after the war. Bull died in 1982 and we knew it would be difficult to find and interview surviving eyewitnesses to Tambu within our modest budget. So we focussed instead on members of the Allen family telling their experiences and retelling stories they had heard told of Bull’s action. We filmed a group interview with David Cranage and members of the family over one morning at the Bull Allen Bar, next to the RSL headquarters in the George Hotel. The interview day was a very moving event for everyone as the family took time to reflect on their memories of their father. We were also lucky to get access to Phillip Bradley, the only Australian historian writing about Salamaua-Wau, and who generously gave us an interview. For visuals we had a wealth of black and white photos from the Australian War Memorial (AWM) archive to draw from, and some special photographs from the Allen family, but the story really started to come alive when we discovered the public domain US wartime newsreels on the FedFlix collection on the Internet Archive. The trembly black and white footage showing actual live action from New Guinea and Mt Tambu was what we needed to take the viewer back to that moment. We found remarkable footage of Allen in 1943 in the Salamaua area. Footage source: Australian War Memorial. The really magic discovery was to find actual wartime footage of Bull, in New Guinea, in 1943, around the Salamaua-Lae area. The film footage had been catalogued in the AWM archive under a Leslie ‘Allan’ and the simple mis-spelling of his name meant it didn’t come up under a standard search for Bull. As far as we could tell, no-one knew this footage existed. Certainly the Allen family didn’t know, and it was a very special day the day we first showed it to them. 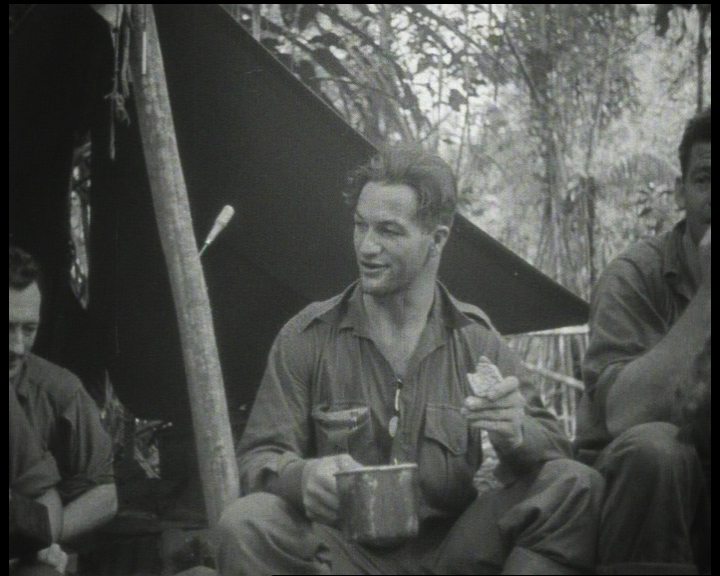 The silent footage, which depicts Bull eating a meal at the camp, gives us an immediate link to the man in that time. Played over the credits accompanied by a rich, melancholic orchestral tune I had written and never found the right use for until now, the footage acts as an eloquent and moving end to the film. The process of making the film, for me, was an education in many things. I was someone who had avoided thinking about and reading about war my whole life. I didn’t like war stories. I felt ambivalent about telling a story of heroism in war. But the more I became involved in Bull’s personal journey through his war, and as I gradually grew to know the Allen family, and witnessed their and the RSL’s reverence, and kindness, and empathy, I realised I couldn’t not be touched by this. I realised that war, regardless of my personal perspective on the reasons for it, impacts and has impacted people’s lives, leaving deep markers in society and in individuals. And to ignore that part of our social history would be an injustice. So I hope this film helps spread awareness about the significance of the Australian campaigns in New Guinea after Kokoda in general, and about Bull Allen himself, specifically. I hope we can embrace a concept of heroism which allows us to recognise and honour psychological wounds. Everything about Bull, his bravery, strength, his larrikin streak, his utter commitment to his comrades, is so appealing, it seems astounding he hasn’t become a household name. Perhaps it’s time that changed. Allen Family, 2012, personal interview by Jary Nemo & Lucinda Horrocks with Bill (Floyd) Allen, Les Allen and Eleanor Johnson, Ballarat, November. Bradley, Phillip, 2012, Hell’s Battlefield, Allen & Unwin, NSW. Dexter, David, 1961, The New Guinea Offensives, Australian War Memorial, Canberra. NAA (National Archives of Australia), ‘ALLEN LESLIE CLARENCE : Service Number – VX12513’, Service Record, Series Number B883, Service Number VX12513. [i] Allen Family, 2012, personal interview by Jary Nemo & Lucinda Horrocks with Bill (Floyd) Allen, Les Allen and Eleanor Johnson, Ballarat, November. [ii] Dexter, David, 1961, The New Guinea Offensives, Australian War Memorial, Canberra, pp.162-69. [iii] Bradley, Phillip, 2012, Hell’s Battlefield, Allen & Unwin, NSW, pp. 254-57. [iv] Dexter, David, 1961, The New Guinea Offensives, Australian War Memorial, Canberra, p.21. [vi] Dexter, David, 1961, The New Guinea Offensives, Australian War Memorial, Canberra, pp.165-66. [vii] National Archives of Australia: Leslie Clarence Allen Service Record, Series Number B883, Service Number VX12513. [viii] Allen Family, 2012, personal interview by Jary Nemo & Lucinda Horrocks with with Bill (Floyd) Allen, Les Allen and Eleanor Johnson, Ballarat, November. [ix] Allen Family, 2012, personal interview by Jary Nemo & Lucinda Horrocks with with Bill (Floyd) Allen, Les Allen and Eleanor Johnson, Ballarat, November. [x] National Archives of Australia: Leslie Clarence Allen Service Record, Series Number B883, Service Number VX12513. [xi] Allen Family, 2012, personal interview by Jary Nemo & Lucinda Horrocks with with Bill (Floyd) Allen, Les Allen and Eleanor Johnson, Ballarat, November.